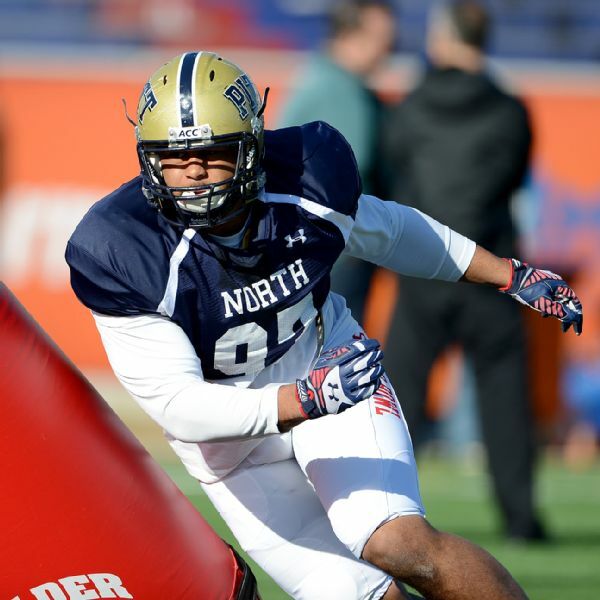 Former Pitt defensive tackle Aaron Donald had a good Senior Bowl. Logan Thomas-QB-Virginia Tech (6-6 254 lbs. ): Good size. Came to the Hokies as a tight end. Big arm. Throws a pretty ball. At times he blows you away with his athletic ability. Very inconsistent .Great physical tools but struggles putting it all together. Lacks pocket awareness and anticipation. Completed 4 of 5 for 17 yards. Tajh Boyd-QB-Clemson (6-1 225 lbs. ): Experienced. Intelligent. Had a 32-8 record as a starter. Has the career ACC record for touchdown passes. Good football IQ and command of the offense. Very good arm. Completed 7 of 16 for 31 yards and 1 INT. Had 2 carries for 8 yards. Stephen Morris-QB-Miami (6-2 218 lbs. ): Very good physical skills, but still needs to put it all together. Led North team, completing 10 of 18 for 89 yards, but also threw 2 interceptions. Charles Sims-RB-West Virginia: Transfer from Houston. Versatile player that is a very good receiver and can return kickoffs. Good burst through the hole and has the speed to get to the edge. Led the Big-12 in yards from scrimmage as a senior. Carried 3 times for 8 yards. Returned 2 kickoffs for 37 yards. James White-RB-Wisconsin (5-10 195 lbs. ): Quick and fast. Very good burst through the hole. Has good moves in traffic. Dangerous in space. Looks small, but is able to play with physicality. Surprising stiff arm. Good hands. Led North team with 62 yards rushing on 11 carries and had 1 TD. Had 5 catches for 15 yards. David Fluellen-RB-Toledo (6-0 215 lbs. ): Good size. Runs with power and moves piles. Determined runner. Averaged almost 7 yards per carry for the Rockets. Had 8 carries for 44 yards and 1 catch for -1. Michael Campanaro-WR-Wake Forest (5-11 190 lbs. ): Runs good routes. Uses his hands and doesn’t let the ball get into his body. Able to return punts. Had 2 catches for 11 yards. Returned 3 punts for 24 yards. Josh Huff-WR-Oregon (5-11 211 lbs. ): Good speed. Competes for the ball in the air. Knows how to create separation. Robert Herron-WR-Wyoming (5-10 187 lbs. ): Runs good routes. Gets inside position on defenders. Had 1 catch for 12 yards. Jacob Pedersen-TE-Wisconsin (6-5 240 lbs. ): Good blocker. Dependable receiver. Physical skills don’t blow you away, but he always seems to make plays. Led North team with 4 catches for 46 yards. Zack Martin-OT-Notre Dame (6-4 308 lbs. ): Underrated. Has handled elite pass rushers and held his own. Also played guard in the game. Short arms. Good feet. Anchors well in pass protection. Very good technique. Seantrel Henderson-OT-Miami (6-8 345 lbs. ): Massive and has long arms. Very talented, but inconsistent. Has some durability and off field issues. Played right tackle for the Hurricanes, but got a chance to play left tackle in this game. Michael Schofield-OT-Michigan (6-7 304 lbs. ): Good pass protection technique. Holds his own against very good pass rushers. Finishes his blocks. Could play tackle or guard at the next level. Cyril Richardson-G-Baylor (6-5 335 lbs. ): Struggled during the week. Big, strong and nasty. Can dominate as a run blocker and finishes blocks well. Can struggle in pass protection against athletic defenders. Brandon Linder-G-Miami (6-6 319 lbs. ): Lacks exceptional athleticism. Touch and nasty. Brawler that excels in run blocking. Aaron Donald-DT-Pitt (6-0 285 lbs. ): Quick and explosive. Normally wins one on one battles but sometimes struggles if the blocker neutralizes his first move. One gap penetrator. Able to use power to defeat blockers. Had a QB hurry that led to an interception. Ra’Shede Hageman-DT-Minnesota (6-6 311 lbs. ): Big frame, but looks slimmer than he is. Freaky athletic. Disruptive. Stout at the point of attack. Very good at batting down passes. DaQuan Jones-DT-Penn State (6-3 318 lbs. ): Uses his hands well. Able to rush the passer from the inside. Will Clarke-DE-West Virginia (6-7 273 lbs. ): Has the body type to be a 3-4 end. Good combination of size, speed and power. Good pass rushing skills. Trent Murphy-DE/OLB-Stanford (6-6 261 lbs. ): Versatile. Played as a 3-4 linebacker for the Cardinal, but played some at defensive end in this game. Relentless pass rusher that led the nation in sacks. Loves to use the power rush. Pursues well. Tackles well in space. It will be interesting to see if he plays as a 4-3 end or a 3-4 linebacker at the next level. Michael Sam-DE/OLB-Missouri (6-2 255 lbs. ): Was a defensive end at Missouri, but may be asked to convert to linebacker in the NFL. Good quickness and flexibility. Had a sack. Christian Kirksey-OLB-Iowa (6-2 235 lbs. ): Team leader. Gives great pursuit. Takes good angles. Able to rush the passer and beat one on one blocks. Chris Borland-ILB-Wisconsin (5-11 246 lbs. ): Lacks ideal height. Short arms. May not have the speed to stay on the field on 3rd down. Was very productive for the Badgers. Always around the ball and makes plays. Brings the wood. Forced a fumble. Jordan Zumwalt-ILB-UCLA (6-4 235 lbs. ): Very intense. Good in pass coverage. Able to cover the deep middle in the Tampa 2 scheme. Nevin Lawson-CB-Utah State (5-10 186 lbs. ): Aggressive. Quick feet. Tends to get holding penalties but that can be cleaned up with technique. Tracks the ball well in the air. Keeps inside position on the receiver. Had an interception. Dontae Johnson-CB-NC State (6-2 195 lbs. ): Uses good technique. Had a pass breakup. Pierre Desir-CB-Lindenwood (6-2 206 lbs. ): Very good instincts. Isn’t fooled easily. Had an interception in the end zone off of a trick play. Stanley Jean-Baptiste-CB/S-Nebraska (6-3 220 lbs. ): Has the size of a safety, but played both corner and safety for the Cornhuskers. Likes to press where he can use his size and strength to his advantage. Drives well on underneath throws. Deone Bucannon-S-Washington State (6-1 198 lbs. ): Good size. Heavy hitter. Sometimes struggles to locate the ball on deep throws. Jimmie Ward-S-Northern Illinois (5-11 192 lbs. ): Good cover skills. Able to cover the slot receiver. Athletic. Fluid hips. Always around the ball. Good instincts. Big hitter. This entry was posted on January 27, 2014 by draftmaniacs in All-Star Games and Combine and tagged 2014 NFL draft, 2014 senior bowl, NFL, NFL Draft, Senior Bowl.